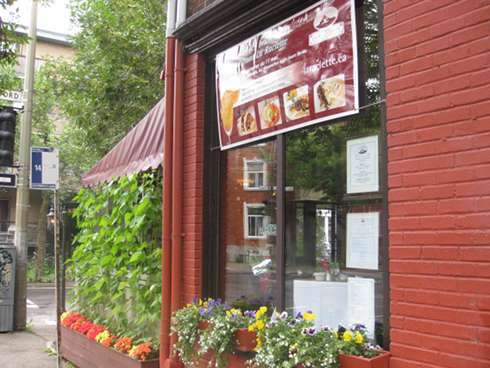 At 1st Glance La Raclette is tucked away on the corner of Gilford & Christophe Colombe. The first thing you will see is its wonderfully decorated terrace and then its large interior with ample seating capacity. 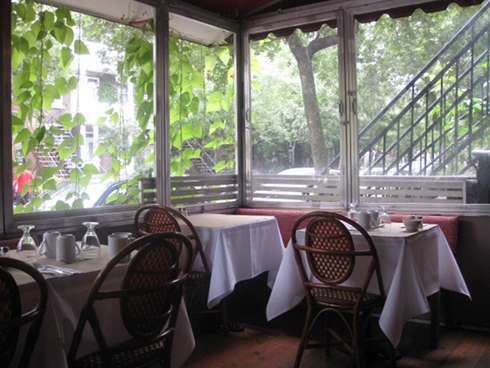 On a nice and sunny day, you can really enjoy brunch on this terrace and even in wintertime you can appreciate a good meal inside the actual restaurant. 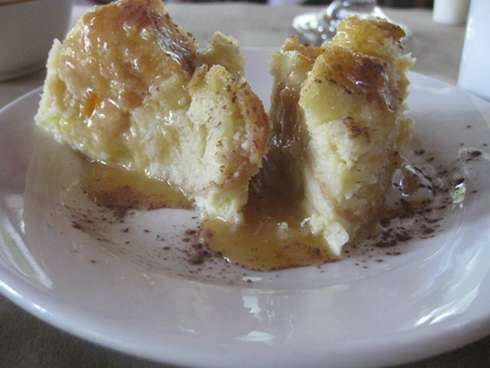 We were treated by a complimentary bread pudding which was is the chef’s inspiration for that day. This dish was a nice treat and added value to the meal. The bread pudding itself was tasty, and sweet, without being a sugar overload. One of the dishes that drew our attention was the Eggs and Chorizo ($15). 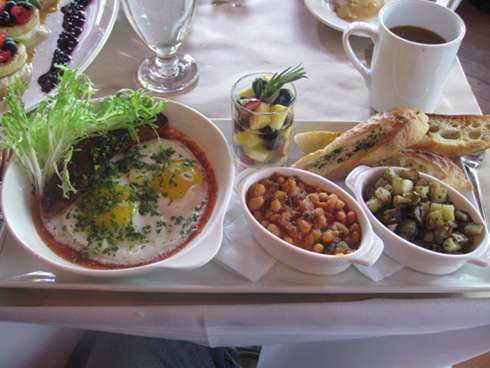 This main eggs dish was topped with delicious pieces of chorizo, a side bowl of beans, a generous bowl of potatoes, a fruit cup, and bread. There is also coffee included in the price with unlimited refills. The dish itself was tasty and you get a great bargain considering the coffee and the sides. My sweet tooth was calling me towards some of the crepes. It took a while before I gravitated to the blueberry ricotta crepe ($15). 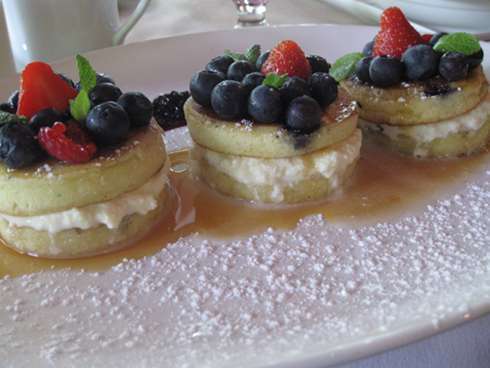 What I got was this stunning platter with 3 mini crepes with blueberries and ricotta in between. Although the crepes seemed more like a mini crepe sandwich, the taste is nothing diminutive and you do get full off of these bad boys. Service Our waitress was quite helpful and gave us a little history on the spot. She was great with our water and coffee refills as well. Vegetarian Some items on the menu are vegetarian friendly. Foie gras dishes in the salty menu all have meat, rest assured but all of the dishes in the sweet menu do not. Wrap up La Raclette is a winner in my books. 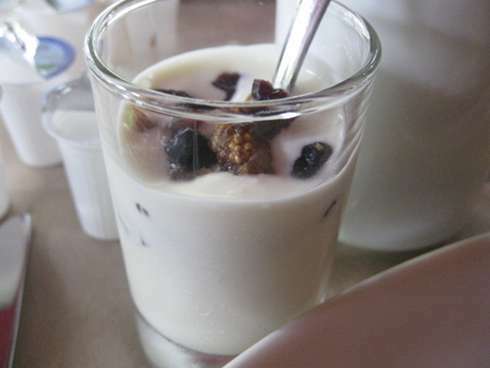 It has tasty dishes, generous portions, free coffee, a terrace and an excellent price point. I will definitely be coming back here again. We went there few weeks ago and it was great to be able to reserve since we were a family of 8 also their promotion of free orange juice when you bring sparkling wine is great! It’s a great place for a celebration. I had a galette bretonne, it was huge and delicious!! The service is top notch! Would love to go back and try another dish. Love your blog! Thank you for providing us with useful infos.